It is the fairest island eyes have beheld; mountainous and the land seems to touch the sky." Shrouded almost perpetually by mists that give Jamaica’s highest mountains their bluish color, the Blue Mountain range sprawls across the eastern portion of the island for a length of 28 miles and an average width of about 12 miles. They rise steeply in an area so compact that it is possible to drive from the coastal plains to an elevation of over 7,000 feet in less than an hour. When Columbus discovered Jamaica in 1494, the mountains were heavily forested. Early Spanish settlers established their hatos or cattle ranches at the foot of the Blue Mountains on the southern coast at Liguanea, the Yallahs Valley and around the Morant Bay area. However, their numbers were few and it was after the island was captured by the English that the lower slopes were cleared for farming and the forests were harvested to meet the great demand in England for Jamaican hardwoods. Today, economic and population pressures have pushed the forest line to around 2000 ft. on the northern slopes and almost 5000 ft. on the southern slopes. The 194,000 acre Blue Mountain and John Crow Mountain National Park was established in 1992 to preserve some of the remaining forests and to protect the island’s largest watershed. The park comprises about 6% of Jamaica’s total land mass. These diverse mountain forests have more than 800 species of endemic plants, the world’s second largest butterfly, Papilo homerus, 200 species of resident and migrant birds and is one of the largest migratory bird habitats in the Caribbean. There are also more than 500 species of flowering plants of which almost one half are native to Jamaica. Of these, the most interesting is perhaps the Jamaican bamboo, Chusquea abietifolia, that flowers only once every 33 years. The next flowering will take place in 2017. From Kingston, two approaches via Irish Town and Guava Ridge converge at the town of Section where the road continues down to Bull Bay on the North Coast. This is the only road that traverses the Blue Mountains and is the main access to the region. All other roads follow the river valleys from the main road around the island to penetrate the lower slopes of the Blue Mountains including the Port Antonio - Bowden road that follows the Rio Grande between the Blue Mountains and the John Crow Mountains. 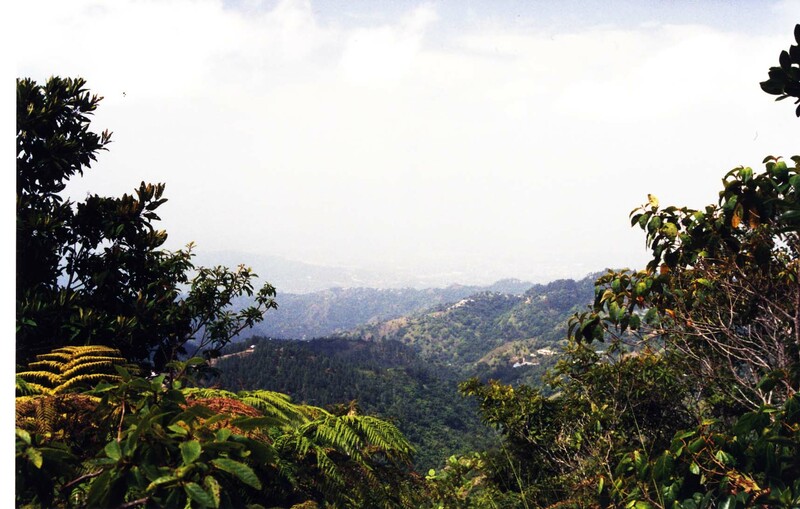 It is this eastern face of the Blue Mountains that receives more than 300 inches of rain each year, providing water for almost one half of Jamaica’s population. Together with the John Crow Mountains, this area is Jamaica’s last remaining rainforest where many rare and exotic plants can be found as well as the world’s second largest butterfly. The land is particularly rugged and when the Spanish fled Jamaica, their freed slaves escaped to these mountains. The Winward Maroons, as they later became known, were led by Nanny, a legendary chieftainess who is said to have possessed magical powers. They harassed the English for decades before signing a treaty whereby they were allowed to live in relative autonomy. There are some very pleasant walks from the small towns along the Port Antonio - Bowden road, especially at Ginger House where there is a pretty waterfall beside a cave and a mineral spring. A swinging bridge across the river connects Ginger House to Cornwall Barracks where British troops once launched their assaults on the Winward Maroons. However, hikes up into the forests are usually very rugged, river crossing, machete wielding, trailblazing affairs. For intrepid explorers, there are trails from the Rio Grande valley to Nanny Town, the original hideout of the Winward Maroons, and to Bath Fountain in St. Thomas where there are hot mineral springs. The traditional Blue Mountain trek is the 7 mile hike to the peak with an increase in altitude of 3000 ft. Jamaicans prefer to reach the peak at sunrise so the 3-4 hour hike is usually undertaken in darkness. The unfolding dawn is very beautiful and on clear mornings, expansive views capture both the north and south coasts. It is well worth the effort although the garbage and graffiti on the little cabins at the top are a disappointment. On leaving the cleared mountaintop, the return trip reveals the botanical richness of the mountain. The trail passes through an elfin forest of stunted soapwood and rodwood trees, their low canopy resulting from extreme climatic conditions. Gradually, the cloud forest takes over with its dense, shaded undergrowth of mosses, lichens, ferns, lianas and lesser trees and gives way to primeval tree ferns, bamboos and shrubs that peter out at the forest line above Whitfield Hall. The true atmosphere of the Blue Mountains is found in the hundreds of paths that connect villages with planting grounds and other villages. These are not recreational trails but utilitarian tracks used by people who live and work in the mountains. There are some nice walks around Newcastle on the Kingston to Buff Bay Road where trails lead to Catherine’s Peak and Mt. Horeb. Beyond Newcastle, the Holywell forest reserve at Hardwar Gap is noted for its tree ferns and birdlife. On the Guava Ridge to Section road, there is a short walk (one mile) from Content Gap to Charlottenberg, an old great house with fine antiques and a beautiful garden. Closer to Section is the road to Clydesdale, an old coffee plantation that is now used as a nursery for the Forestry Department. About two and a half miles above Clydesdale, is the Cinchona Botanical Garden that was established in 1868 to grow cinchona trees for the manufacture of quinine. When the project failed, it was taken over by the Jamaica Department of Gardens and Plantations. Although it is now much reduced in size and in semi-abandoned condition, there is a wonderful collection of trees and flowering shrubs from all over the world. The once forested, lower slopes of the Blue Mountains are now mostly grasslands but some areas are used for the cultivation of vegetables, spices and the world renowned Blue Mountain coffee. The first coffee seedlings were brought to Jamaica from Hispaniola in 1728 by the Governor, Sir Nicholas Lawes. The mountain slopes were cleared to establish coffee plantations and by the first quarter of the 19th century, Jamaica was the leading coffee producer in the world. The industry fell into decline after Emancipation when Jamaica could no longer compete with slave owning countries like Brazil and Cuba. Today, Jamaican Blue Mountain coffee is considered to be among the best of the gourmet coffees in the world. To ensure the quality, the Jamaica Coffee Industry Board set standards for the coffee beans and the processing in order to carry the ‘Blue Mountain Coffee’ label. 90% of the island’s production is exported to Japan. Although some coffee estates remain, most of the beans are grown on small plots by local farmers. Considering the retail price of Jamaican coffee worldwide, the farmers get a pittance for their crop and some opt to roast and sell their own beans. A number of them can be found on the Kingston-Buff Bay road near the little town of Section. The process of hand picking ripe berries then drying, curing and roasting the beans is time consuming. Each farmer has his own ‘secret’ process and is happy to explain why his is the very best. It’s an excellent opportunity for coffee connoisseurs to sample a variety of roasts and to purchase a truly unique product. It is safer to hike in the Blue Mountains during the dry period from December to April because its numerous, rapidly flowing rivers create floods and landslides during heavy rains. It is also the time when the rest of the island is most comfortable. The Blue Mountains can be approached from various points along the coastal main road, but the most popular route is from the capital city of Kingston. Buses travel between the major towns and mini-buses connect towns to villages. From Kingston, most buses to the Blue Mountains depart from Papine. Comfortable clothing and walking shoes, a warm jacket and pants, rain gear, a hat with brim, suntan lotion, insect repellent, flashlight, and a water bottle. A day trip to the Blue Mountains is easily arranged through the travel desk of any hotel. However, some planning is required for those wanting to spend more than a day as arrangements must be made in advance. To arrange a Blue Mountain trek, hikers should plan to spend the night close to the trailhead. Hikes get underway between 1:00 a.m. and 5:00 a.m. so as to reach the top before the mist obscures the view. Three places to overnight are Whitfield Hall (Tel-Kingston: 876-927-0986), Wildflower Lodge (Tel-Kingston: 876-929-5394) and Pine Grove (Tel-Kingston: 876-977-8009, Fax: 876-977-8001). Whitfield Hall offers budget bunk-style accommodations with shared bathrooms, no hot water, and a kitchen that is available for preparing your own meals. Rooms at Wildflower Lodge are small with sink, toilet and communal showers. There is no electricity or hot water. Meals are available on request. Pine Grove has individual bedrooms with en suite bathrooms, hot water and will prepare meals on request. All three will arrange to pick up guests at Mavis Bank near the end of the bus route or at Papine. 2 WD vehicles may be left safely at the Mavis Bank Police Station. Bird watchers and botanists favor the forested areas of the Hardwar Gap and the Rio Grande Valley. There are campsites and inexpensive but very rustic cabins at Holywell forest reserve. Visitors must bring their own food and bedding and arrangements must be made in advance at the Forestry Department in Kingston (173 Constant Spring Road, Tel: 876-924-2667). Most people prefer to use Port Antonio as a base for visiting the Rio Grande Valley. Around Newcastle, the Jamaica Defence Force rents some very basic military cottages. (Tel: 876-944-8230). Strawberry Hill is a nearby mountain-top resort that offers guided hikes. Rooms cost US$300-600 per night (Tel: 876-944-8400, Fax: 876-944-8408). With prior arrangement, it is possible to spend the night at Charlottenburg Great House. It can be reached by a short walk from Content Gap or a longer walk from Gordon Town. (Tel:876-978-3530 or 876-927-0752). Clydesdale offers basic rooms and campsites are available at Cinchona Botanical Gardens. Arrangements for both must be made in Kingston at the Forestry Department. (173 Constant Spring Road, Tel: 876-924-2667). Starlight Chalet will arrange nature walks and mountain hiking trips for their guests. A 4WD vehicle offers the most options for exploring the Blue Mountains. Do plan to use a guide. It is not safe to hike on your own. Trails are easily washed away in heavy rains and you will want to avoid trouble spots such as hidden ganja fields. Always carry a supply of food. The few restaurants are expensive and the supplies available in the little towns are limited or non-existent. This is particularly important for overnighters in the area. Do visit some of the numerous pools and waterfalls on the northern slopes. Occasionally, the Natural History Society of Jamaica plans field trips into the Blue Mountains and nearby John Crow Mountains with special emphasis on their flora and fauna. Contact them directly for information on dates and prices. 173 Constant Spring Road, Kingston 8, Jamaica W.I. The Forestry Department provides campsites and/or basic cabins at Portland Gap (along the Blue Mountain Peak trail), Holywell Forest Reserve, Clydesdale and Cinchona Botanical Gardens. Reservations must be made in advance at their office in Kingston. Blue Mountain Tours has bicycle trips from Hardwar Gap down to Buff Bay. There are frequent stops for photographs as the ride passes through tropical rainforests and coffee plantations with dramatic mountain views. The tour package includes hotel pick-up and drop-off as well as lunch and snacks. Arrangements may be made at your hotel tour desk. 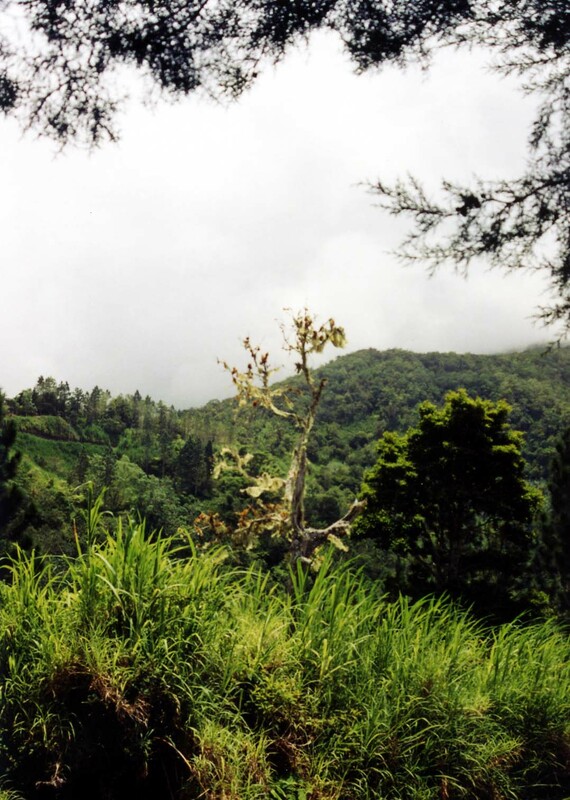 Jamaica: A Visitors Guide by Harry A. Pariser provides a sensitive look at the environmental issues affecting the Blue Mountains. We were particularly pleased with his descriptions of Cinchona, Clydesdale, Newcastle, Hardwar Gap and Buff Bay as we consider these to be some of the most beautiful places in Jamaica. The Adventure Guide to Jamaica by Stephen Cohen is an excellent guide which describes the more popular trails of the Blue Mountains including the one to the Peak. Blue Mountain Guide is edited by Dr. Margaret Hodges and published by the Natural History Society of Jamaica. This small, inexpensive volume can be purchased at most local bookstores or by contacting The Natural History Society of Jamaica, The Department of Life Sciences, University of the West Indies, Mona, Kingston 7, Jamaica WI. Jamaica: A Lonely Planet Travel Survival Kit by Christopher Baker offers practical, helpful information about Jamaica and is an excellent general guide with good historical insight on the different areas of the island.